Opening processing centers in transit countries in the hope that it will curb the number of illegal immigrants is Brussels’ answer to the inflow of refugees, who risk their lives to cross the Mediterranean in search of a better life. The measure is part of the new European Agenda on Migration, which will be published later in mid-May. At a media conference this week, Dimitris Avramopoulos, the European Commissioner for Migration and Home Affairs, said amending the way the EU deals with illegal immigration is an urgent issue that requires complex solutions. “When presenting a comprehensive European Agenda on Migration we have to think about all dimensions of migration – this is not about quick fixes; this is about creating a more secure, prosperous and attractive European Union," he said. "We need to be effective, as Europeans, on the immediate response and at the same time to address the root causes, starting from the crises spreading at our borders, most of all in Libya,”said EU foreign policy chief Federica Mogherini.“That's why we are increasing our work with origin and transit countries to provide protection in conflict regions, facilitate resettlement and tackle trafficking routes." Last year, over 276,000 people entered the EU illegally, which is 155 percent more than in 2013, according the EU borders agency Frontex. 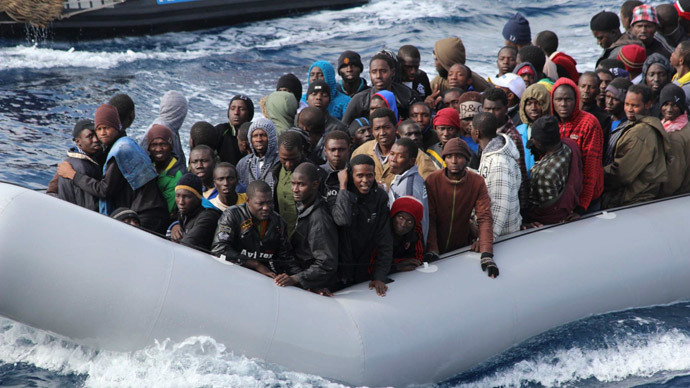 Some 220,000 arrived via the Mediterranean, with at least 3,500 and possibly more than 4,000 people dying en route. The passage is considered the most dangerous in the world. Establishing processing centers in countries like Niger, Egypt, Turkey or Lebanon represents a U-turn in EU policies as the idea is gaining traction among the more affected members. Southern European countries including Italy and Malta are among those members of the union that pay the greatest price dealing with the inflow. France and Germany also favor the idea. Strong opposition to the idea remains among national governments less eager to welcome refugees from countries like Libya and Syria on their soil, such as Denmark and the UK. Part of the reluctance is because some EU members don’t want to relinquish authority over immigration policies to Brussels. Hungary, which faces an influx of illegal refugees from Kosovo rather than North Africa, wants to reserve the right to bar would-be immigrants. Opponents of the processing centers argue that offering legal ways to apply for asylum would not stop people from trying to smuggle themselves into Europe. Anti-immigrant right-wing politicians in European countries, who have been gaining electoral sway in the past few years, want less legitimate methods for immigrants and a tougher stance on illegal immigration. There is also the issue with the would-be hosts of these centers, who would have to deal with people, whose applications were rejected and who would likely try to stay in transit countries rather than return to their own countries. Whether the EU would be willing to pay for refugee camps in those transit countries in addition to paying for processing centers personnel is a big if. A coherent immigration policy would also require the 28 members to come to terms with sharing the burden of refugees, which would be a challenge in its own right. Italy scrapped its relatively successful Operation Mare Nostrum, which rescued illegal immigrants in the Mediterranean citing the unwillingness of other EU members to share its cost. The EU-run replacement operation Triton is just one third in size and is mandated to patrol no further than 30 nautical miles from Italy’s coast. The European Commission recognized that Triton is not a proper replacement, but hasn’t come up with a better solution so far.